We are pleased to present new work by artist Matt Ernst in his second solo exhibition, The Future of an Illusion, which opens at 511 GALLERY on Thursday, February 22 and runs through April 7, 2005. The artist builds up the surfaces of his large canvases with layers of found material. Whether it be a discarded "tag" or graffiti spray painted on a FedEx sticker, torn sheets of printed material from street billboards or ledger paper and drawings from Ernst's own sketchbook, the work reveals an organic variety of texture and immediacy. 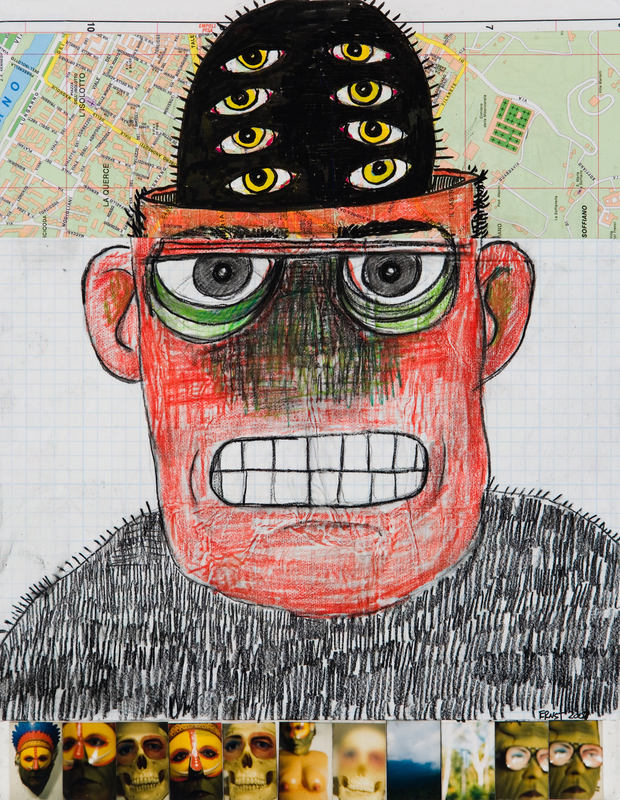 The artist then adds to this foundation of collage, drawings and paintings of open narratives: conflict, fear, hope, violence, and isolation within the natural world. Ernst takes his title from a book published by Sigmund Freud in 1927, in which Freud describes religion as an illusion, "the fulfillments of the oldest, strongest, and most urgent wishes of mankind;" in Matt Ernst's body of work, the civilizing forces of society are represented as now having become illusory. Ernst's previous series, The Icarus Pictures resisted direct moral or even political statements, although one found it difficult to disregard the inherent socially relevant imagery within. The artist created images of helicopters, jets and airplanes which served as cultural signifiers within the instability of today's social climate. The new paintings address similar issues yet replace broad cultural signifiers with direct references to humankind and one's own battle with the forces of nature, the cruelty of Fate, and the constraints of so-called civilized life. In doing this, Ernst introduces discernable symbols of evolution, violence and the subconscious struggle between nature and humankind. 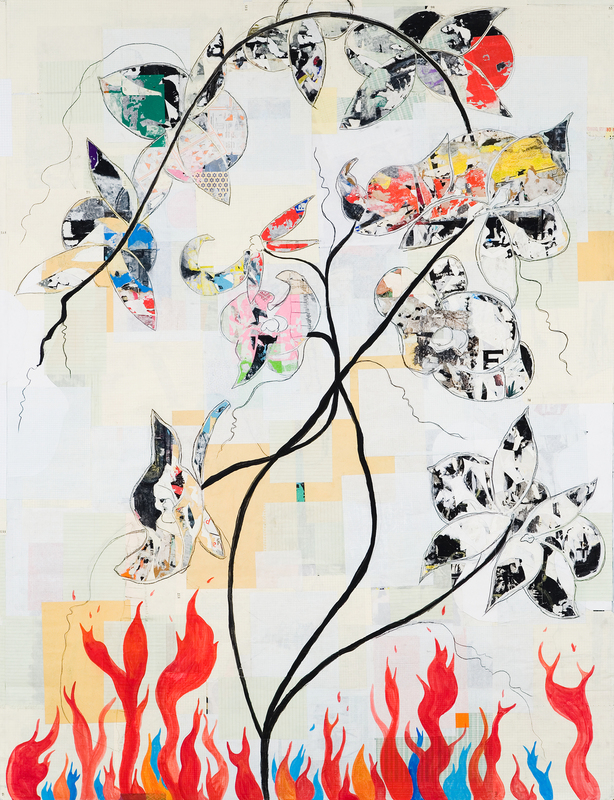 Ernst's work, Return to Hiroshima (2006), is a mixed media collage on canvas from his current show. 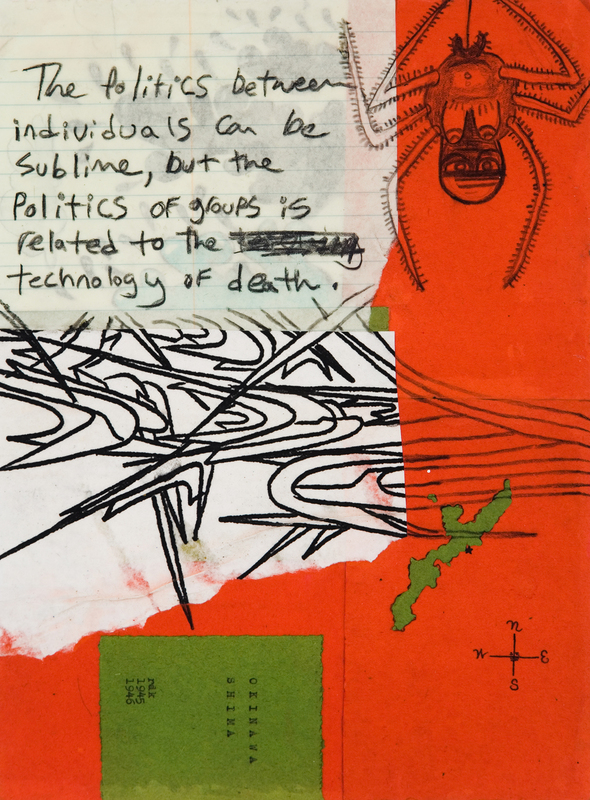 The artist worked the surface with layers of notebook and ledger paper while incorporating text and images from a book of the same name. Collaged within the form of an evolving tadpole are black and white photographic reproductions of civilians performing daily activities; perhaps a statement on rebirth and renewed growth within the context of Hiroshima after WWII. Ernst integrates the notion of natural evolution from tadpole to frog with human life's own destruction and renewal; commenting on humankind's conscious -- or even subconscious -- urge to dominate and control the world. The "illusion", it seems, derives from our natural wish to dominate and control.